The modern methods of cooking indeed have become much more sophisticated and hassle free. Microwave ovens are probably one of the greatest inventions allowing anyone to prepare a delectable dish within a few minutes.It,however,runs on electricity and one cannot simply rely on a microwave oven for everyday meal preparations. Thus it is a good idea to have some basic kitchen appliances and a gas oven which certainly will come in handy. While shopping for kitchen appliances,one must make sure to get the pressure cooker.If you are going to stay alone at a place you might think that there is no real need of having a pressure cooker,but the fact is it is one of the best cooking appliances available and will save a lot of time and energy for you. Pressure cooker comes in many varieties.In the Indian market among the major pressure cooker products are the basic pressure cooker with fixed pressure range.However,in the western countries pressure cookers with various functionalities and variable pressure setup are available,which is pretty much like the microwave oven,only the controls are on the lid.If you are going to be in India it will be better to stick to the basic pressure cooker products since you will get easy replacement of any part if damaged,and also for a single person it is unnecessary to invest too much into the pressure cooker. 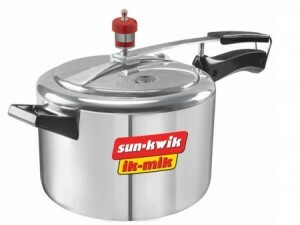 • Capacity – Pressure cookers come in various capacities.Make sure you have the right capacity suitable for your purpose.The Indian pressure cooker models come in terms of “litres” denoting the quantity. 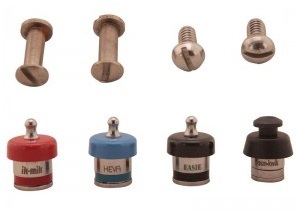 • Lid locking mechanism – Check this is simple and you can use this conveniently. • Pressure – Go for the one which gives an extra option in terms of pressure weight. • Safety Valve – Check if the safety valve is properly operational. • Warranty – Go for the reputable one with maximum warranty period. There must be the whistling utensil in your cupboard in the kitchen that you always wanted to use but wasn’t sure about it.Probably it is the old memory of bursting and splattering food everywhere in the whole kitchen,still haunts you. But that was long before.Pressure cooker has gone through a lot of changes since then.It has become safer and more useful too. When you are rushing for office or running with your kids you need to do everything much faster. You need to cook fast too.But that does not mean necessarily that you will compromise with your food and nutrition.Pondering over how to do it? Well,the solution is in your hand.The pressure cooker and pressure cooker products have too many benefits to count.What are they?Take a look. When you are cooking on a stovetop pan,most of the nutrients get evaporated and a very less food value remains of it.It takes more time to cook in the open pan.The longer it is cooked,the more nutrients will be evaporated.But when it is cooked in pressure cooker,a quite little quantity of food gets evaporated with steam.At the same time,the shorter time of cooking makes it possible to retain the colour and flavor of the food too. As a result the food retains most of the nutrients and taste of the food. Pressure cooking saves a lot of energy.When you are boiling in one pot and cooking in the other,it becomes the reason of wastage of energy.With pressure cooker you cook in one single pot in a quite shorter time.As a result a lot of energy gets saved. Pressure cooker also helps to maintain the cooler atmosphere in kitchen.When you are cooking on the stove top,automatically it increases the temperature of kitchen.It becomes quite difficult for you to work in a heated kitchen for a long time.Pressure cooker helps to maintain the normal temperature in the kitchen. It also prevents the juices and the sauces to spill and cause a mess in the kitchen. Go past of the hesitation and start using the pressure cooker.It is a lot safer and more convenient way to cook. The pressure cooker no doubt is one of the most important of all kitchen appliances and utensils.Ever since its inception,it has proven to be an efficient way of cooking,saving time as well as energy and fuel.However,in current market the variety of pressure cooker available is simply overwhelming and most of the time puts the customer in a bewildering position unable to choose the right one.Even though there is many sophisticated and modern pressure cookers available which allows a number of functions and utilities in one,we as Indians prefer to keep a few things simple.The more advanced pressure cookers are also extremely high priced and are not available easily.Unless you have the resource to invest in one such pressure cooker and the company’s service centre nearby to replace the damaged parts,it will be better to stick to the old conventional pressure cookers. The most important part to check while buying any pressure cooker is the lid.The mechanism of locking the lid is often made complicated in effort to make it something different from the rest by some of the companies.Try opening and then closing the lid at the store.If you are having difficulty in performing these operations,it is probably best left alone.Also,the lid must be securely placed over the cooker.There are incidents of lids blowing off due to the excessive pressure.Inner lids generally are useful in prevention of such scenario.In India,many popular company models,such as the Sunkwik Keva pressure cooker have inner lid. This type of lid gets securely placed and locked from inside the pressure cooker and cannot blow up. 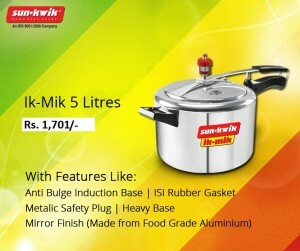 The pressure weight placed on top of the cooker should also be checked properly.It should not be too tight nor should it be too loose.It should be perfectly fixed so as to allow the excess pressure to disperse.The safety valve present on the lid is also essential for prevention of any accident.It is best to rely on renowned company models such as Sunkwik Keva pressure cooker while buying a new cooker for home. Pressure cooker is the fastest means of cooking food.In the current lifestyle,when we do not have the luxury of spending much time in the kitchen,pressure cooker is our best friend.With time the pressure cooker has also evolved including many new technologies and making our lives easier.So,if you are going to buy one, make sure you have done your homework to know more about the various types of pressure cooker products. First Generation –The first generation pressure cookers are the simplest kind and also the most affordable among the ones currently available in the market.These pressure cookers come with an airtight lid and a weight bearing valve on top to control the pressure. Second Generation –The second generation pressure cookers have a spring weight bearing valve which can be calibrated to increase or decrease the pressure within the cooker.This offers a little more flexibility in terms of cooking options as compared to the first generation ones. Third Generation –The third generation is the most recent and advanced among all types of pressure cooker products.These have in-built microchip which helps in calibration of internal pressure.The chip also calculates the status of cooking within the cooker and measures if the pressure is too high or low.This is the most preferred type as well among the current buyers. There has been a long standing debate on whether aluminium pressure cooker is better or the stainless steel ones.To be honest,there are pros and cons of both the products.The aluminium pressure cookers most certainly get heated quicker than the stainless steel products.On the other hand, the stainless steel pressure cookers are much more durable and sturdy and do not react to any type of food.Also the third generation pressure cooker products are available in stainless steel models.Depending on your budget you may choose any one that suits your purpose well. There definitely isn’t a household kitchen which does not have a pressure cooker. It is one of the most popular and definitely one of the most efficient kitchen equipment available. The introduction of pressure witnessed a huge popularity and ever increasing demand because of the dramatic reduction in cooking time by using a pressure cooker. Besides being a cooking apparatus, pressure cooker also found its usage in sterilizing jars and bottles. 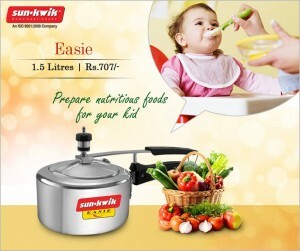 Even till date pressure cooker is the preferred means of sterilization of baby bottles. 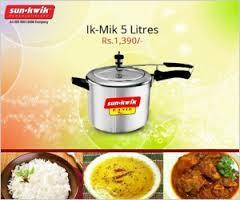 Over the decades, since its inception, pressure cooker has undergone huge transformation. 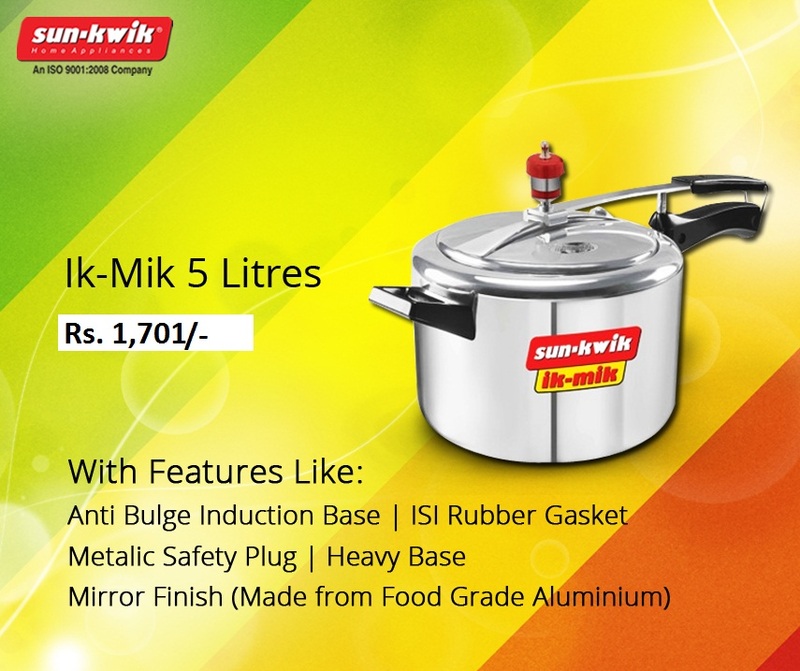 The basic models which the pressure cooker manufacturers first introduced was made completely of aluminium, a soft metal which heat up pretty fast, reducing the fuel consumption in heating the utensil. The top lid of the pressure cooker keeps the utensil air tight. 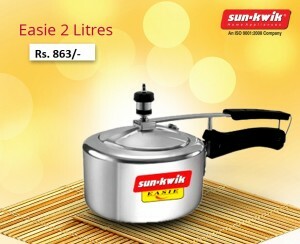 A weight placed on the top nozzle regulates the pressure within the cooker. This pressure that this model can generate within is fixed. 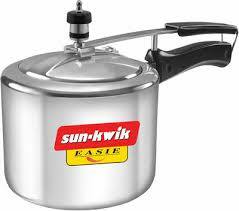 Later the pressure cooker manufacturers introduced the model with a spring loaded top weight. The adjustment of the spring allows the user to regulate the pressure within the cooker. 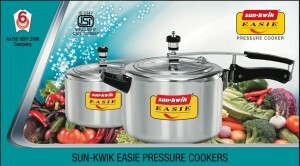 This allows the user to use the same pressure cooker for a variety of purpose. 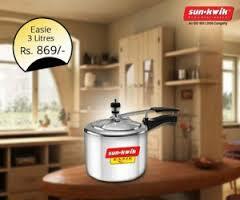 The most recent variety of pressure cooker available in the market is the electric pressure cooker. The electric pressure cooker has a microchip and an IC which allows the user to monitor and control the pressure within the cooker, depending upon the food item being cooked. There are preset functions available as well which makes it easy for the user to determine the amount of pressure that will be required for certain type of item. The microprocessor also monitors the quality of the food being prepared and prevents overcooking and preservation of nutrients of the food. 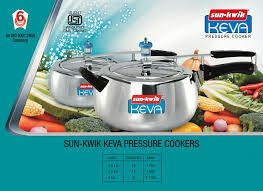 There are a number of pressure cooker manufacturers available in the market. One can check out the various models being offered and the price tag on each type, and decide to settle for the one providing maximum value for money. 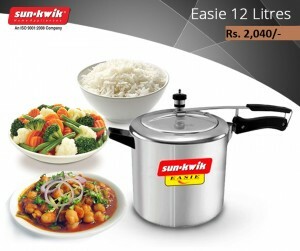 Online stores are also common and useful when it comes to shopping for pressure cooker. •There are a number of pressure cooker manufacturer and each of them are marketing their product at their best.You must remember that the highest price does not always determine superior quality. So check for the one which will be most efficient and comes at a reasonable price. •The pressure within a pressure cooker is vital for cooking food in short time.Most pressure cooker manufacturer mentions the psi value in the product specification.The higher the psi the more is the pressure created within the cooker and the shorter time it would need to cook the food.Generally a pressure cooker must have a minimal psi value. In US pressure cooker manufacturers have been directed to manufacture cookers which have a minimal 15 psi to destroy any microbe within the food.Nowadays you can also get pressure cookers which let you control the pressure. •The size of the pot is important too.You should get such a size which will be enough for the entire family.It is advisable to keep at least two different sized cooker if you have a small family and at times a number of guests visit you for a few days. •Warranty is an important thing to consider as well.Since most pressure cooker manufacturers provide a general duration of warranty,most of us forget to consider this point.However,it is very important that you check if you are getting a warranty long enough to justify the price of the product. •Availability of spare parts should also be a point to consider.If your pressure cooker manufacturer is a new one in the market or if the product range is fairly new,chances are that you will have to depend only on the company when any problem arises post warranty. Keep these few points in mind and you can get yourself a decent pressure cooker and enjoy cooking at its best. If you are rushing to work or running to the school with your kids,it is obvious that you don’t have time for cooking.The fast pace of life right now gives us a very little time to sit back,leave alone cooking.It is impossible to compromise with health by eating junk food every day.The only thing that can help you to cook fast as well as retain the taste and the nutrients is a pressure cooker. Now pressure cooker is an essential article in our regular kitchen.It is becoming more and more modern with every passing day.Now induction based pressure cooker is also becoming popular in our country. Pressure cookers retain the essential vitamins and anti oxidants in the food.The juice remains in the cooker after cooking.It is full of nutrients.Anti oxidants also remains that helps us to fight the signs of aging.When you are cooking in closed pots it takes notoriously long time to cook.But in the case of pressure cooker,the whole process of cooking happens within few minutes. The boiled food cooked in high temperature often creates acrylamide that is harmful for health.Pressure cooking reduces the formation of acrylamide.As a result the food cooked in pressure cooker becomes healthier that the cooked food in other method. The short time of cooking helps to retain nutrients.When you are cooking in a stove top vessel,the nutrients evaporate with steam.But in pressure cooker it takes a very little time that does not let the nutrients to evaporate. 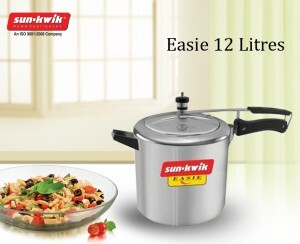 Choose the right pressure cooker for your home, cook healthy and stay healthy.